To kick things off this week, we have Blue Estate, Resogun Heroes expansion and R.B.I. Baseball 14 for the PS4. Farming Simulator 14 crops up on the PS Vita along with Z-Run, BlazBlue: Chrono Phantasma and Atelier Rorona Plus: The Alchemist of Arland. Transformers: Rise of the Dark Spark and Valiant Hearts: The Great War lands on both the PS4 and PS3 this week too. 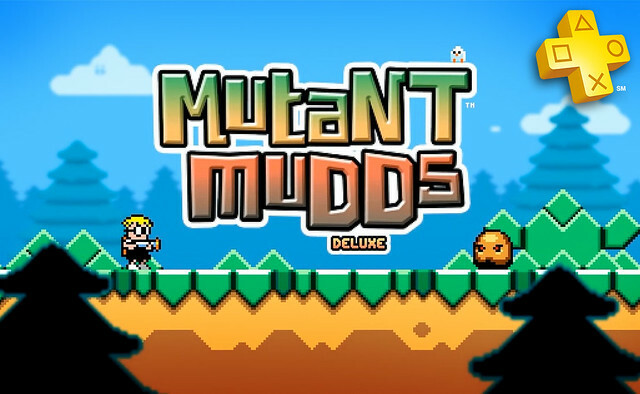 Mutant Mudds Deluxe is the free PS+ download for this week so make sure to queue it up. Pre-order Sniper Elite 3 and receive the Hunt the Grey Wolf mission in your download list after checking out. Experience an assassination attempt like no other in this tense pre-order mission for Sniper Elite 3! Featuring an expansive open environment and randomised target identities, journals and locations, no two playthroughs will be the same. The question is – can you tell fact from fiction, the real target from the double? Play the game on 7/1 starting midnight EST. Pre-Order DYNASTY WARRIORS: GUNDAM Reborn and receive an exclusive theme for your PS3 system’s XMB menu screen in your download list after checking out. You’ll also be able to access the Beargguy Mobile Suit and “Who is the Strongest Shade of Red” mission as a bonus when the game releases. Play the game on 7/1 starting midnight EST. • Includes Over 40 playable characters from two different universes! • Change Form Anytime: Effortlessly switch between robot and vehicle form! • Beyond the Movie: Weave your way through Earth and Cybertron universes in an unforgettable battle to secure the Dark Spark. Blue Estate is a darkly funny on-rail shooter based on the comic books from Viktor Kalvachev. While experiencing the smoothness of motion controls with the DUALSHOCK4 wireless controller, play as the psychopathic Tony Luciano and the ex-soldier Clarence as they face the most dangerous enemies. Bloodshed is always better when shared, so invite a friend to join the massacre, through a nervous cooperative mode! This is the story of crossed destinies and broken love in a world torn apart. Of people who will try to survive the horror of the trenches, following their faithful canine companion. In Valiant Hearts, the lives of these characters are inextricably drawn together over the course of the game. Friendship, love, sacrifice and tragedy befall each one, as they help each other retain their humanity against the horrors of war. It’s all about the teams, the rivals & the race in an intense world of professional motorsport. Racing alongside a teammate, overcome key rivals & satisfy team sponsors in ferocious races where every pass & position counts. In a huge career, specialise in your favourite racing discipline or conquer them all feel the aggression of the pack in Touring Cars, race Open-Wheel cars with precision, manage tyre wear in Endurance events, show car control in Tuner events & react on the fly in Street races. Join us in celebrating over 1.3 million downloads of DOA5U: Core Fighters! For a limited time only, get Mila as a gift with your free download! DOA5U: Core Fighters offers all the content of Dead or Alive 5 Ultimate (except for certain characters, music, and Story mode) so anyone can experience the intuitive fighting system, gorgeous characters and blockbuster stages of Dead or Alive. Atelier Rorona returns better than ever! This remake of the 2010 hit will entertain both new and veteran users. Check out updated 3D models, a restructured game system, new characters, and more! *Limited time Campaign! For 4 weeks after release, get the new ‘Peach Vacation’, ‘The Orange Swimsuit’, ‘The Lady’s Etiquette’ costume set free! Farming Simulator 14 invites you into the challenging world of a modern day farmer: cow husbandry, plant, harvest and trade in crops… Own and operate your very own farm…wherever you go! • Melee attacks keep you running for longer as you knock zombies off their feet with a slide attack. Throughout history, mysterious objects known as ‘Atomigems’ have existed all over the world. The people of the world have used them for many things, from simple family heirlooms to even objects of worship. However, recently, a gang known as the Underworld has been going around collecting any and all Atomigems they can find. What exactly is their aim? The hero of the Capital returns! It is still the prosperous Taisho era in Japan’s capital when devil-summoning detective Raidou Kuzunoha the 14th is thrown into his next great case. When the Narumi Detective Agency is hired in a missing person case, Raidou finds himself on the trail of crooked gamblers, masked ninjas, and strange insects…all leading to the mysterious King Abaddon. Jerry’s back in Crackle’s Emmy-nominated series Comedians in Cars Getting Coffee, continuing his tradition of grabbing some coffee and off-the-cuff laughs with a friend as they cruise the streets in a classic car. Jerry is hanging with George Wallace in Las Vegas on this week’s episode, premiering at noon ET/9am PT, with new episodes premiering Thursdays. Gohere for more information. Get your body ready for the summer with DailyBurn and your PS3. DailyBurn offers unparalleled variety – from bodyweight training and kettlebells, to dance and yoga – so you can always find the perfect workout! Sign up here to try DailyBurn totally 100% FREE for 30 days. True to the end. The fate of Bon Temps hangs in the balance as Sookie, Bill & Co. face insidious new threats, and shocking realities, in the seventh and final season of the “fangtastic” HBO hit drama True Blood. Watch the season premiere and every episode of every season on HBO GO on PS3. Catch the trailerhere. The All-Star break is getting closer and divisional rivalries are heating up. Watch HD Quality broadcasts of every out-of-market game live or on demand on your PS4. Choose Home or Away feeds, pause and rewind live game action with DVR capabilities. Sign up here. Get ready for the next chapter in the Transformers Saga by watching the first 3 films digitally or at your nearest kiosk. Also, check out Lone Survivor, 300: Rise of an Empire or Non-Stop, all available now to rent or buy! Subscribers be sure to check out the Unrated Cut of World War Z and enjoy some all-time favorites like Major League, The Free Willy Collection and GoodFellas! Sign up for Redboxhere. The Money in the Bank briefcase lets WWE Superstars realize their dream of competing for the WWE World Heavyweight Championship. Don’t miss any of the action at WWE Money in the Bank, Sunday June 29, 8e/5p. Don’t have WWE Network? Subscribe today! Check back next week for the games on sale during the second week of Summer Blast 2014!